After the Mp44/StG44 Sturmgewehr was starting to see substantial production and field use, the German military and the Mauser company began working on a way to simplify production of the weapon. The design for the Gerät 06H actually began with the Gerät 03, an attempt to make a roller-locked G43 rifle in 8x57mm. An accident with automatic fire and bolt bounce sparked the idea of roller-delayed blowback, and Mauser engineers incorporated this concept into a rifle in the same layout as the StG-44 and using the 8x33mm cartridge. The Gerät 06H would successfully complete early prototype trials, and was ordered to be fully developed, with the designation StG-45(M). The next step in the process was to make a small batch of guns for extended trials. A total of 30 more guns were ordered, but they were not completed by the time US troops began threatening to overrun the Mauser complex at Oberndorf. All the most valuable material at the factory was packed into a train with the intent of reassembling the factory in a secret cave in the Austrian Alps. The train left Mauser on the night of April 21/22 1945, with the incomplete sets of StG45(M) parts aboard. US and British military intelligence men found the train in June, and took the parts into custody. Eventually, imprisoned Mauser staff held in the Netherlands would be put to work assembling some of these rifles so they could be tested by Allied governments. The roller-delayed blowback system would find its way to Spain with a number of former Mauser men, where it was developed into the CETME rifle and adopted by Spain. The Heckler & Koch company was formed to continue this work when arms development again became legal in Germany, and the system would see massive worldwide use as the G3 rifle, MP5 submachine gun, and many other derivative weapons designs. 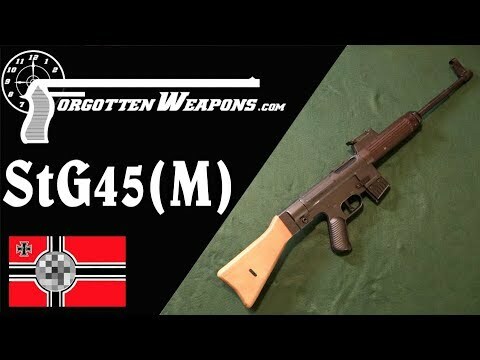 The rifle in this video was a set of StG-45(M) parts that found its way into private hands after the war, and was eventually purchased by Dutch gun collector and industrialist Henk Visser. He bribed the fire control parts diagrams out of the British, and used his ownership stake in Mauser to have the remaining parts (the FCG, stock, and receiver endcap) made and the whole thing assembled into a complete firearm by Mauser in the 1960s. The original trunnion shattered when proof tested, and a new trunnion was made (presumably with better heat treating…). Mistakenly thinking that 19 of the parts sets had been assembled in the Netherlands after the war, Visser had his rifle serialized as V-20, and it retains that number and a Mauser banner logo today. The rifle today is in a private collection in Malta, where its owner and the Association of Maltese Arms Collectors and Shooters generously invited me to bring it to you on film. Sarah Sanders Shuts Them Down! Priceless!